This latest horological masterpiece from Bovet marks a significant turning point in the development of the collection while simultaneously highlighting the Pininfarina distinctive design codes. The Tourbillon OTTANTASEI remains faithful to the essential lines that characterize the collection laid down by the Tourbillon Ottanta® in 2010. While a mere glance is enough to confirm its membership of the BOVET by Pininfarina family, the Tourbillon OTTANTASEI is bursting with technical innovations and stylistic changes all harmoniously planned around a detailed series of specifications. The word “light”, with its dual connotations of luminosity and limited weight, was the watchword for every stage in the development of this project. The case of the timepiece fully embodies this “philosophy”. The technicians and watchmakers at the Manufacture DIMIER 1738 together with the designers at Pininfarina pooled their expertise to come up with an unprecedented perspective on the originality and fascinating technology inherent to the movement, once again entirely developed and manufactured by BOVET. Four large sapphire crystals occupy the main surfaces, while contrasting elements in titanium or gold trace the essential contours of the collection’s design and guarantee the qualities required for its sportier traits. Far more than just a case, it recalls a whole lexicon of aviation and evokes the glass surrounding the cockpit of an aircraft or helicopter. Without making the connection explicit, the Italian designers and technicians at BOVET 1822 took an active interest in the subject while developing the case, given that the constraints of rigidity, transparency and water-resistance are, relatively speaking, very similar. To create maximum light and transparency, the upper and lower crystals have specific and complex forms. Two long side crystals enclose the case and embrace the profile of the middle perfectly. The accurate machining and delicate metallization of the sapphire crystals provide superb views of the movement, while the touch of elegance synonymous with both Houses is present through the laser-engraved words ‘Pininfarina’ and ‘limited edition’ on the inner concave surfaces of these sapphire crystal walls. Of course, the distinctive screws designed by Pininfarina used on all the timepieces in the collection are also a feature. 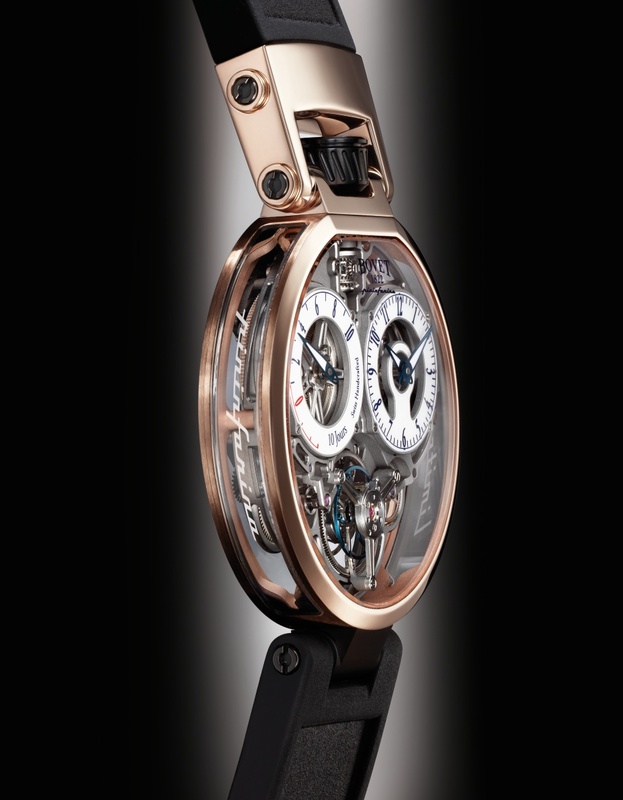 As regards the crown, although its winding surface is identical to all of the collection’s tourbillons, its top is set with a sapphire crystal laser-engraved with the emblematic Pininfarina logo above a polished mirror surface—an aesthetically stunning and ingenious way of showcasing the third dimension. The case of the Tourbillon OTTANTASEI also features a clever casing-up system via the case back, ensuring greater transparency and lightness, as well as optimal dimensions for complete ergonomic comfort. The net weight of the metal for the entire case is 51.66 g for gold and 15.54 g for titanium. With its 44 mm diameter and a thickness of 8.85 mm and 12 mm with and without the sapphire crystals respectively, the Tourbillon OTTANTASEI offers maximum comfort whatever the shape of the wearer’s wrist. Technically speaking, all efforts have been concentrated on the principles of lightness and transparency. Three distinct circles outline the movement’s organs and vital functions, with the balance and harmony that are so dear to Pascal Raffy. The eye alights first and foremost on the single barrel and its concentric power-reserve indicator at 10 o’clock. Then, it moves on to the hours and minutes displays featuring the same configuration at 2 o’clock, before finally considering the flying tourbillon in the airy space freed up at 6 o’clock. The 10-day autonomy of the Tourbillon OTTANTASEI should involve twice as many turns of the crown than that required by the spherical differential developed and patented by the watchmakers at DIMIER 1738. The extreme miniaturization of this mechanism has inspired them to file a second patent for the three-dimensional multiple meshing teeth, which drastically reduce clutter while optimizing the watch’s operation. The timepiece can thus be wound twice as quickly to give it the power required for 10 days of autonomy. The plate underpinning the entire movement highlights the perfectly accomplished and delicate synergy between lightness and transparency on the one hand, and increased structural rigidity on the other. Half a day of machining and EDM is required to create a single plate. The craftsmen from the decorating workshops then require a full day to ensure the unrivalled quality finishes. Sandblasting, drawing, beading, Côtes de Genève and hand-chamfering are just some of the artisanal skills that feed into the process, and the slightest mishap can cause irreparable damage. Note that this genuine feat of three-dimensional magic involves decorating and, in particular, chamfering both sides of the plate as well as all its vertical walls. To achieve the outstanding technical performances of the Tourbillon OTTANTASEI, the technicians and watchmakers opted for a single barrel with extraordinary characteristics. Measuring just 1.04 m long with a developed force of 1 kg, it can provide 240 hours of energy with optimum consistency. In tune with the spirit of the timepiece, the barrel is skeletonized according to the five-spoke wheel theme that has been chosen for the design of this caliber. It can be found at several locations on the plate, the barrel bridge, the ratchet and the tourbillon bridge. Like the decorative features detailed further on, the gear train and its finishes perfectly embody the spirit of fine watchmaking practiced by BOVET 1822 and its Manufactures DIMIER 1738. Every wheel in the finishing gear train has been painstakingly angled and chamfered by hand, while the pivots of their axes are rolled in the traditional manner for quality and performance that border on perfection. It is this gear train that leads us to from the barrel to the display and, ultimately, to the spectacular tourbillon carriage. The highly original flying tourbillon carriage is made up of no fewer than 104 components. Its many innovations include a unique bridge at the center of its axis. In addition to its balanced masses and subsequently reduced lever effect, the tourbillon carriage seems to move more freely than ever before within its own space. This ingenious construction owes its existence to the patented double-sided tourbillon, which features the escapement and balance spring positioned on either side of the central fixation point, thus enhancing both the watch’s chronometric performances and aesthetic quality by clearly revealing the escapement and balance spring on both sides of the caliber. This innovative construction and single fixation point both contribute to the superbly weighted thickness of the movement, and of the timepiece itself. The 18,000 vph of the balance are maintained by a spring manufactured traditionally at the DIMIER 1738 workshops. The balance-spring felloe is an exact copy of the one equipping the legendary Ottanta® tourbillon. Cloaked in the blue of Pininfarina’s corporate logo, it takes the form of a figure eight surrounded by the zero that graces the collection’s many tourbillons. Other factors that underline the Tourbillon OTTANTASEI’s lineage to the BOVET by Pininfarina family include the finishes developed and designed specifically for the collection, which magnify the alternating surfaces and volumes of the movement. 34 shades ranging from black to white are used on the various strata that make up the volume of this movement. The same applies to the bipolar Clous de Paris circular décor developed exclusively for the collection’s tourbillons, which is featured here in two sumptuous plates screwed to the barrel bridge. This enchanted journey into the heart of a transparent movement then leads us to the astonishing power-reserve indicator. The barrel engages with a wheel that turns one way or another, depending on whether the watch is being wound or is unwinding during operation. The center of its axis features a feeder screw on which a meticulously polished steel cone moves vertically. When the timepiece is being wound, the cone travels up the screw and activates a lever against the wall via a ruby runner. The second arm of this lever culminates in a toothed rack that meshes with a pinion located on the axis of the indicator. Thus, during winding, the hand notches up the values it encounters before “spending” them through a reverse movement when the timepiece is operating, resulting in a precise and unprecedented expression of this invaluable function. As usual, the two dials of this timepiece were entirely manufactured in the BOVET 1822 workshops. 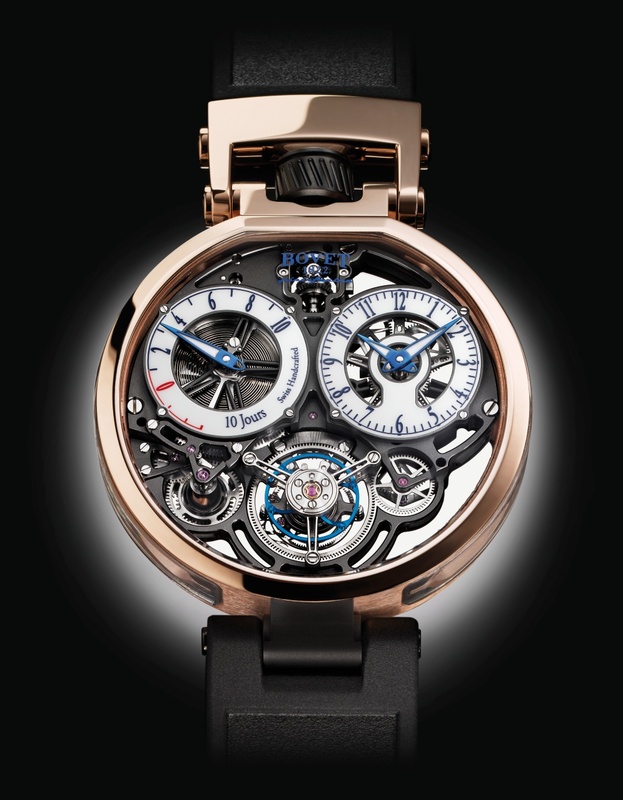 Involving thin rings rather than solid disks, the various machining, decorating, lacquering, and hot-stamping operations all required the care and incomparable expertise of the House’s craftsmen to achieve the excellence that has established the reputation of BOVET 1822 for nearly two centuries. The immaculate white lacquer of the dials is also a nod to the history of the House and the pocket watches it manufactured at the dawn of the 19th century. Three case options are available to collectors, who have a choice of 18-carat red gold, grade 5 titanium, or black DLC-treated grade 5 titanium. To perfect the coherence of the entire collection, the traditional black rubber strap boasts a refined design, a blue alcantara lining, and the collection’s traditional buckle to match the material selected for the case. Once again in this collection, the quantity of movements manufactured will be limited—to just 86 in this case—which the collector can choose to grace with one of the three cases on offer. A plate bearing the individual number of each movement will be meticulously screwed to the back of the case chosen to adorn the timepiece. The virtuosity of the craftsmen at the BOVET Manufactures combined with the recognized technical expertise and reliability of the various mechanisms and their peerless finishes allow every aspect of this exceptional caliber to be showcased with perfect transparency. Buoyed by the excellence demonstrated daily by the BOVET 1822 craftsmen in each of their creations, Pascal Raffy has opted for an international five-year warranty as a testament to the irreproachable quality of the Tourbillon OTTANTASEI.